Here in the Midwest, we are heading quickly toward fall. Fall bring about many wonderful things including apples, pumpkins, cool nights and fall celebrations, but for many it also means the return of seasonal allergies. For those of you looking for more holistic treatments for those pesky allergies Bach Flower remedies are a wonderful alternative. We've already discussed how homeopathy can help with allergies. For more information on that click here. 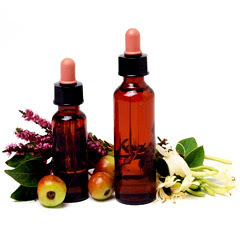 Bach flower remedies are a little difficult to describe in the context of a short blog, but I will try to give you a little background information. First and foremost they are made from natural herbal substances such as walnut, holly, oak, and crab apple to name a few. Their purpose is really to treat the emotional aspect of a person and therefore the emotional aspect of a disease or ailment. This may sound strange for most of us, but if you believe like I do, that much of our chronic problems are stress related; and most stress can be tied into an emotion, such as fear, anxiety, or hopelessness. Over time you can see how these emotions could lead to physical distress. You might say then that these remedies are designed to get at the root of the problem. Now, let's move on to allergies. Allergies are strong reactions that are triggered by certain substances. Our bodies have been previously exposed to a substance (such as pollen, animal hair, food, or chemicals), becomes sensitized, and cannot tolerate that substance anymore. In some cases, these reactions can be very strong and cause severe even life-threatening conditions. Beech: Beech should be used as a basic essence for treating all allergies and conditions related to intolerance. Crab Apple: Sometimes chronic infections play a role in allergies. They can poison the body and make it overly sensitive. Crab Apple is the most important detoxifying essence. Holly: Holly helps in cases of strong immune reactions. This can be used, for example in severe fits of sneezing, clear cases of irritation, or allergic shock. You can use the essences alone or combine all three. Look for Bach Flowers at your local natural health store or order them online. Frontier is a place I've ordered them before. Give Bach Flowers a shot - you'll be surprised how great they work.